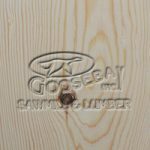 Unfinished Flooring Archives - Goosebay Sawmill and Lumber, Inc.
•	6” and 8” widths in stock. •	Lengths 6’ to 16’. •	Harder and more durable than white pine. •	Select grade available with special order.